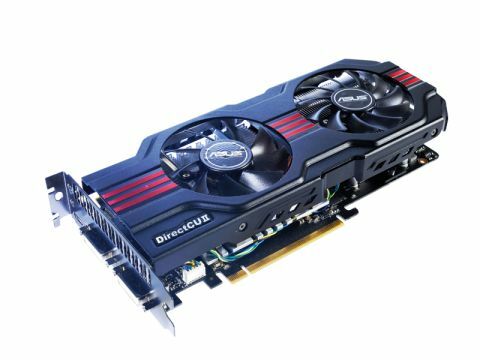 This overclocked graphics cards offers improved performance at a cheap price. So what gives? You know how it goes: Nvidia releases a new GPU, everybody signs up to re-badge the reference design and throws it out at launch. Li'l while later, and for a bit of a premium, you'll find new spins of the card that have new coolers, higher clocks and sometimes a bit of extra graphics memory for giggles. But you are nearly always paying that premium. I say nearly because the Asus GeForce GTX 560 Ti Direct CU II, as well as being a bit of a mouthful, is also bizarrely cheaper than a lot of the competition. Unfortunately when the board is pushed to the 950MHz mark that the Zotac GTX 560 Ti AMP! sits at, it starts to become as flaky as Alicia Silverstone. It's nothing to do with the cooling, but I think this GPU, essentially a slightly re-worked GeForce GTX 460 processor, has gone as far as it can go. We were unable to get at the voltage controls to pump a bit more juice into the chip to steady the ship. Asus' bundled SmartDoctor OC utility is far from our favourite, but with an Asus card it ought to offer access to the voltage. We couldn't even get it to recognise that our board had in fact come from Asus though, even if GPU-Z hapily proved it really was. Despite all that, in performance terms though there really is precious little difference between a GeForce GTX 560 Ti running at 900MHz and one running at 950MHz. Typically the Asus Direct CU II cooling array is quite magnificent. When idling away the temperature sits incredibly low, and the same goes for its loaded performance. In essence then you're not really losing out opting for this cheaper, sub-£200 alternative. And it really is mighty cool.